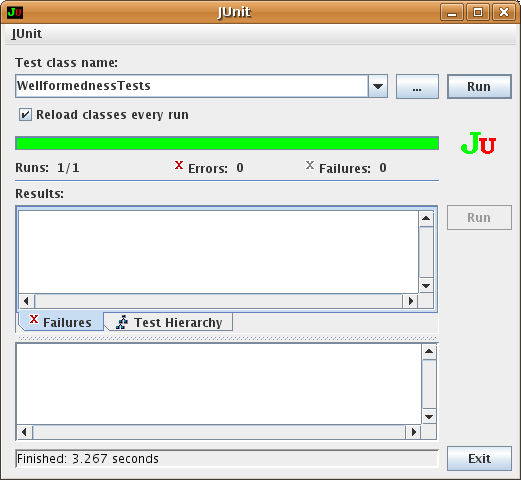 JUnit (http://www.junit.org/) is the standard Java framework for unit testing, and the one on which a lot of the more specific frameworks such as HtmlUnit and HttpUnit are built. There’s no reason you can’t use it to test web applications, provided you can write Java code that pretends to be a browser. That’s actually not as hard as it sounds. For example, one of the most basic tests you’ll want to run is one that tests whether each page on your site is well-formed. You can test this simply by parsing the page with an XML parser and seeing whether it throws any exceptions. Write one method to test each page on the site, and you have a very nice automated test suite for what we checked by hand in the previous section. Listing 2.2 demonstrates a simple JUnit test that checks the well-formedness of my blog. All this code does is throw a URL at an XML parser and see whether it chokes. If it doesn’t, the test passes. This version requires Sun’s JDK 1.5 or later and JUnit 3.8 or later somewhere in the classpath. You may need to make some modifications to run this in other environments. If all tests pass, you’ll see a green bar as shown in Figure 2.3. Figure 2.3: All tests pass. To test additional pages for well-formedness, you simply add more methods, each of which looks exactly like testBlogIndex, just with a different URL. Of course, you can also write more complicated tests. You can test for validity by setting the http://xml.org/sax/features/validation feature on the parser and attaching an error handler that throws an exception if a validity error is detected. You can use DOM, XOM, SAX, or some other API to load the page and inspect its contents. For instance, you could write a test that checks whether all links on a page are reachable. If you use TagSoup as the parser, you can even write these sorts of tests for non-well-formed HTML pages. If nondevelopers are making regular changes to your site, you can set up the test suite to run periodically with cron and to e-mail you if anything unexpectedly breaks. (It’s probably not reasonable to expect each author or designer to run the entire test suite before every check-in.) You can even run the suite continuously using a product such as Hudson or Cruise Control. However, that may fill your logs with a lot of uncountable test traffic, so you may wish to run this against the development server instead. Many similar test frameworks are available for other languages and platforms: PyUnit for Python, CppUnit for C++, NUnit for .NET, and so forth. Collectively these go under the rubric xUnit. Whichever one you and your team are comfortable working with is fine for writing web test suites. The web server doesn’t care what language your tests are written in. As long as you have a one-button test harness and enough HTTP client support to write tests, you can do what needs to be done. HtmlUnit (http://htmlunit.sourceforge.net/) is an open source JUnit extension designed to test HTML pages. It will be most familiar and comfortable to Java programmers already using JUnit for test-driven development. HtmlUnit provides two main advantages over pure JUnit. The WebClient class makes it much easier to pretend to be a web browser. The HTMLPage class has methods for inspecting common parts of an HTML document. Listing 2.3 demonstrates the use of HtmlUnit to check that all the links on a page are not broken. I could have written this using a raw parser and DOM, but it would have been somewhat more complex. In particular, methods such as getAnchors to find all the a elements in a page are very helpful. // Check that we can download this page. This test is more than a unit test. It checks all the links on a page, whereas a real unit test would check only one. Furthermore, it makes connections to external servers. That’s very unusual for a unit test. Still, this is a good test to have, and it will let us know that we need to fix our pages if an external site breaks links by reorganizing its pages. Listing 2.4 demonstrates an HttpUnit test that verifies that a page has exactly one H1 header, and that its text matches the web page’s title. That may not be a requirement for all pages, but it is a requirement for some. For instance, it would be a very apt requirement for a newspaper site. I could have written this test in HtmlUnit too, and I could have written Listing 2.3 with HttpUnit. Which one you use is mostly a matter of personal preference. Of course, these are hardly the only such frameworks. There are several more, including ones not written in Java. Use whichever one you like, but by all means use something. JWebUnit is a higher-level API that sits on top of HtmlUnit and JUnit. Generally, JWebUnit tests involve more assertions and less straight Java code. These tests are somewhat easier to write without a large amount of Java expertise, and they may be more accessible to a typical web developer. Furthermore, tests can very easily extend over multiple pages as you click links, submit forms, and in general follow an entire path through a web application. Listing 2.5 demonstrates a JWebUnit test for the search engine on my web site. It fills in the search form on the main page and submits it. Then it checks that one of the expected results is present. // text on that page is as expected. FitNesse (http://fitnesse.org/) is a Wiki designed to enable business users to write tests in table format. Business users like spreadsheets. The basic idea of FitNesse is that tests can be written as tables, much like a spreadsheet. Thus, FitNesse tests are not written in Java. Instead, they are written as a table in a Wiki. You do need a programmer to install and configure FitNesse for your site. However, once it’s running and a few sample fixtures have been written, it is possible for savvy business users to write more tests. FitNesse works best in a pair environment, though, where one programmer and one business user can work together to define the business rules and write tests for them. For web app acceptance testing, you install Joseph Bergin’s HtmlFixture (http://fitnesse.org/FitNesse.HtmlFixture). It too is based on HtmlUnit. It supplies instructions that are useful for testing web applications such as typing into forms, submitting forms, checking the text on a page, and so forth. The external page at http://www.elharo.com/blog/ is then loaded. In this page, we focus on the element named meta that has an id attribute with the value charset. This will be the subject for our tests. The test then looks at two attributes of this element. First it inspects the content attribute and asserts that its value is text/html; charset=utf-8. 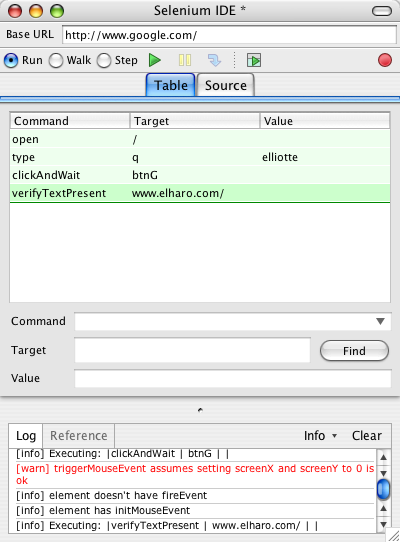 Next it checks the http-equiv attribute of the same element and asserts that its value is content-type. This test would be embedded in a Wiki page. 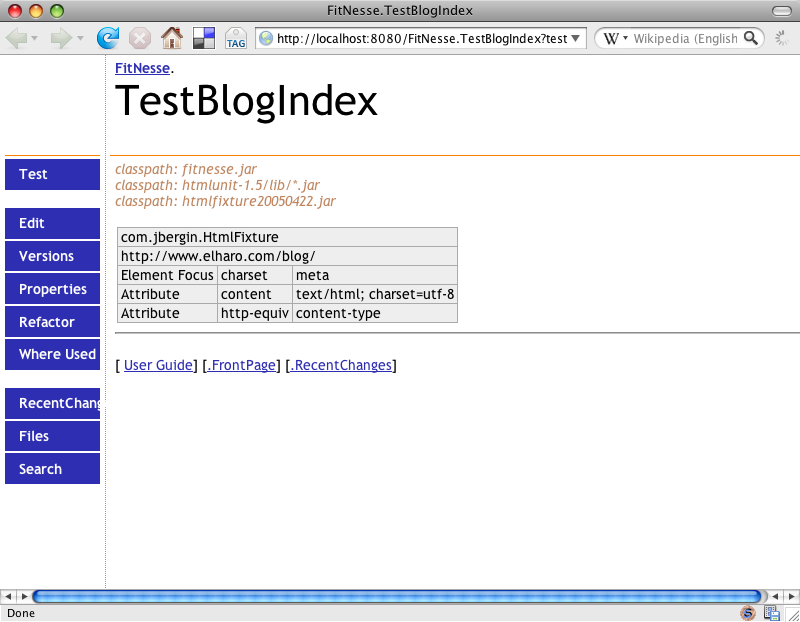 You can run it from a web browser just by clicking the Test button, as shown in Figure 2.4. If all of the assertions pass, and if nothing else goes wrong, the test will appear green after it is run. Otherwise, it will appear pink. You can use other Wiki markup elsewhere in the page to describe the test. Although you can write tests manually in Selenium using remote control, it is really designed more as a traditional GUI record and playback tool. This makes it more suitable for testing an application that has already been written, and less suitable for doing test-driven development. Listing 2.7 demonstrates a Selenium test that verifies that www.elharo.com shows up in the first page of results from a Google search for “Elliotte”. This script was recorded in the Selenium IDE and then edited a little by hand. You can load it into and then run it from a web browser. Unlike the other examples given here, this is not Java code, and it does not require major programming skills to maintain. Selenium is more of a macro language than a programming language. The IDE can also export the tests as C#, Java, Perl, Python, or Ruby code so that you can integrate Selenium tests into other environments. This is especially important for test automation. Listing 2.8 shows the same test as in Listing 2.7, but this time in Ruby. However, this will not necessarily catch all the cross-browser bugs you’ll find by running the tests directly in the browser. Because you’re refactoring, you already have a web site or application; and if it’s like most I’ve seen, it has limited, if any, front-end tests. Don’t let that discourage you. Pick the tool you like and start to write a few tests for some basic functionality. Any tests at all are better than none. At the early stages, testing is linear. Every test you write makes a noticeable improvement in your code coverage and quality. Don’t get bogged down thinking you have to test everything. That’s great if you can do it; but if you can’t, you can still do something. Before refactoring a particular page, subdirectory, or path through a site, take an hour and write at least two or three tests for that section. If nothing else, these are smoke tests that will let you know if you totally muck up everything. You can expand on these later when you have time. If you find a bug, by all means write a test for the bug before fixing it. That will help you know when you’ve fixed the bug, and it will prevent the bug from accidentally reoccurring in the future after other changes. Because front-end tests aren’t very unitary, it’s likely that this test will indirectly test other things besides the specific bit of buggy code. Finally, for new features and new developments beyond refactoring, by all means write your tests first. This will guarantee that the new parts of the site are tested, and tests will often leak over into the older pages and scripts as well. Automatic testing is critical to developing a robust, scalable application. Developing a test suite can seem daunting at first, but it’s worth doing. The first test is the hardest. Once you’ve set up your test framework and written your first test, subsequent tests will flow much more easily. Just as you can improve a site linearly through small, automatic refactorings that add up over time, so too can you improve your test suite by adding just a few tests a week. Sooner than you know, you’ll have a solid test suite that helps to ensure reliability by telling you when things are broken and showing you what to fix. This entry was posted on Wednesday, June 18th, 2008 at 10:17 pm and is filed under Refactoring HTML, Testing. You can follow any responses to this entry through the Atom feed. You can make a comment, Digg this story, or trackback from your own site. I don’t think TDD works well for web development. In my experience, web sites developed using HtmlUnit or similar tools tend to be of much _lower_ quality than sites developed without any unit tests on the front end at all. Which of course opens up the glaring question of why. The fact is that TDD takes resources away from other things. In cases where you’re writing underlying libraries this is almost always a good tradeoff, in that the robustness of the back-end saves countless hours of debugging in the layers built on top of it. In web development, this does not apply. Have artists design the pages. Convert to HTML and hook into back-office systems. In some sense this is like all other software development. But the important distinction here is that the cost of changes to web pages is very small compared with changes to shrink-wrapped or back-office software. With the web it is possible to have extremely short release cycles and frequent design changes. In fact, the general public has come to expect their web sites to be continually refined to make their experience more gratifying.